An emergency helicopter has been mistakenly scrambled after a Google wi-fi balloon ditched in the sea near Christchurch in New Zealand. The plummeting balloon, measuring 12m (39ft) in height, was spotted by a pedestrian who thought a light aircraft was in trouble and contacted police. Google said it would repay the cost of sending the helicopter to the scene. In June 2013, 30 balloons were launched by Google in New Zealand to provide wi-fi in remote areas. The call to the emergency services initially led to the launch of a lifeboat off the South Island’s east coast. The helicopter was called in when the rescuers could not recover the balloon because of rough conditions. “We will get in touch with the Westpac rescue helicopter crew to reimburse them for the mistaken rescue flight,” Google spokesman Johnny Luu told news site Stuff New Zealand. 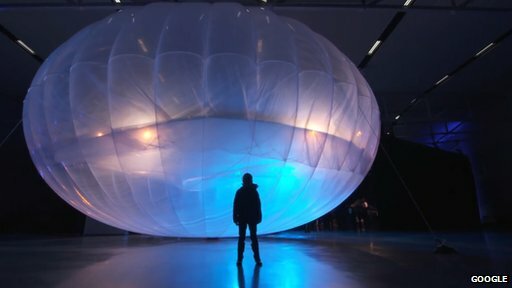 Last year’s launch marked the start of Google’s Project Loon, which will eventually employ up to 400 balloons encircling the Earth to give people wireless net access. The balloons will float in the stratosphere around the Earth’s 40th parallel, providing wi-fi to buildings fitted with a special antenna. They are designed to stay up for about 100 days, and when they descend, co-ordinators try to guide them down on to land. Most balloons were recovered after landing, Mr Luu added.